Mika 141M is one of the top Shear Force daughters in production. Ironically she is also is from his very first calf crop. She has been the poster child representing the maternal power that Shear Force sires. As an 11 year old cow, she possesses a foot and udder of a cow half her age. 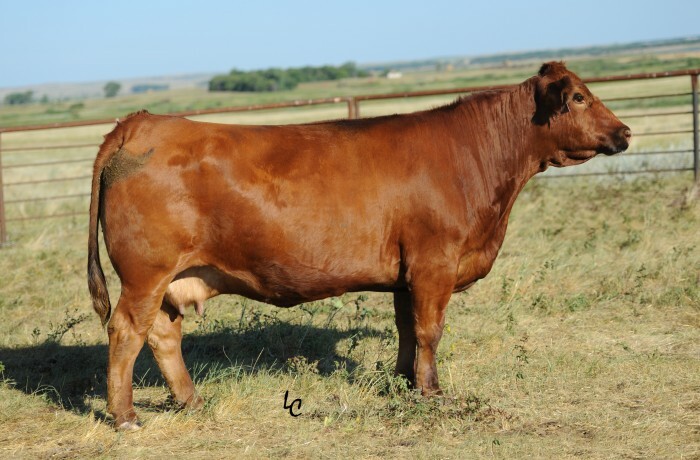 She has produced Hook’s Xpectation (2011 high seller), Hook’s Yukon (2012 high seller), CDI Beef King (2013 high seller) and Hook’s Union 68U (2013 2nd high seller) who also resides here at C Diamond. Open and flushing for 2014.